India is a big place so to talk about traditional Indian food is a bit like saying tradtional European food, each Region has its own style of cooking and some special ingredients and dishes. From a simple climatic point of view, India ranges from alpine tundra and glaciers in the north, through desert to tropical rainforest and monsoon climates. So it is hardly surprising that there are different ingredients and culinary practices. Indian agriculture is almost entirely dependent on rainfall so although the monsoons can be quite devastating, they are very important. When I was in India a few years ago I was caught in what the locals called a 'shower' - it was the end of the monsoon season. It was essentially like standing under a waterfall. It turned a car park into a foot deep lake in 10 minutes, here are some of the 'amused' locals just after the rain stopped. The monsoons affect most of the Indian sub-continent in some way but the effects are vastly different across the country. 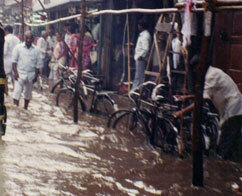 Some parts such as Bangalore get heavy rain for 8 or 9 months of the year, others such as Lucknow for just 3 or 4 months. There are also significant differences in temperature ranges. From the South West which is constantly hot to Kashmir which has bitterly cold winters but moderate summers. All this geography will affect what can be grown in any particular area. So in the South, the idea of traditional Indian food often involves coconut and fruits, and the food is certainly spicier the further south one goes. In the North there is much more emphaisis on wheat and dairy products. Overlaid onto the weather is the cultural aspects, each region has its own history, culture and religious mix. Hindu is a religion which advocates vegetarianism, though the degree does differ. Some are strict, most are lacto-vegetarian (the will eat dairy products) some eat eggs and fish. There are Hindus that will eat meat; they will not eat beef as the cow is revered but will eat pork, lamb and chicken. Jains, a small minority, are not only strict vegetarians but also don't eat onions and garlic, and this is also true of the strict Hindu pandits. Muslims form about 13 or 14% of the Indian population and, of course, a large percentage of the Pakistani and Bangladeshi population and they do eat meat (but not pork). Sikhs, who form about 2% of the Indian population, are a little more divided on the subject. There are both vegetarians and non vegetarians. So the variations in cuisine across India can be quite large and surprising; the 'traditional Indian food' you will see in any given region will depend not only on its geography and what is available (coconuts don't grow in the mountains) but also on its cultural make up which in turn is dependant on its history. If you want to read more on general Indian culture there is a good site Real Facts About India which has some interesting information on travel, people, culture, religion as well as few other foodie bits.